On the 15th January 2018, multinational government contractor and construction firm Carillion suffered perhaps the most dramatic fall from grace in recent history. Its collapse has since rattled the UK construction industry, delaying key public infrastructure projects and spreading a number of damaging ripple effects along the supply chain. This is only one of the most recent cases of aggressive accounting gone bad, but in Carillion's case, there is a twist to the tale. Euromoney's in-depth guide, Deconstructing Carillion: When Aggressive Accounting leads to Collapse, diagnoses the cause of Carillion's collapse, explains why nobody saw it coming, and reveals how a debt-fuelled disaster on this scale can be prevented in future. What's more, the guide includes supporting diagrams, statistics, and a checklist for analysts to help them spot fraud before it brings down a company. Would you like to organise bespoke training that relates to the core themes of this guide? 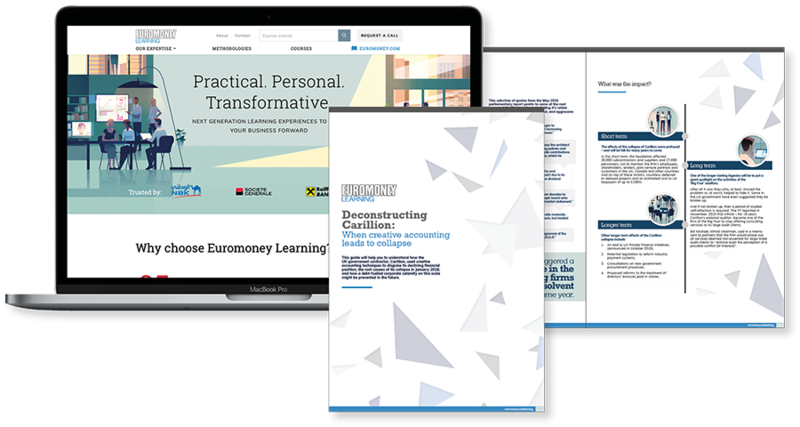 Please email learning@euromoney.com or call +44 (0)208 889 8543 and one of our Learning Advisors will explain how we can support your organisation's goals by delivering engaging and practical learning experiences that ultimately help your people do their jobs better.